It's still January, so I'm still thinking New Year's resolutions! Each year I pick a word to live by, but this year I decided to extend it to our little family in the form of a family motto. When I found this framed embroidered quote while visiting Utah for Christmas, I knew this was our theme. It's a life lesson that my husband and I feel is especially important for our children to learn now, while their mistakes are still relatively inconsequential. It's just on their level, but it is so crucial to their success in life. Of course when I saw this piece I though, I could make that! But I also knew I probably wouldn't get around to it for six months and by then it would be too late. Plus it was only $9.95. My time is worth that much at least. That said, I will definitely be making one like this for next year's theme, whatever it may be. The quote is stitched on muslin, wrapped around a batting-covered piece of cardboard, and framed. Easy peasy. If you want to make something like this but need help with your hand-stitched letters, check out this awesome tutorial from Studio Calico for using printed letters as a guide. 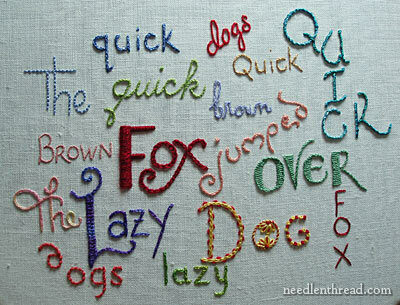 Or this index of 15 tutorials for great hand-stitched letters from Needle 'n Thread! I'm headed to CHA in LA in a couple of hours and I'm too excited to sleep! If you don't know what CHA is, you'll want to check back over the next few days to see what my lucky eyes will be seeing. If you do know what it is, you'll really want to check back! Ta-ta for now. . .
Lovely idea and great to involve the children. I didn't know what CHA meant, but I googles it, :^) Can't keep secrets anymore, lol. I reaslly like this quote. My daughter teaches 5th grade & is always trying to get her students to make good choices. She tries to show them that whatever choice they make, they need to be prepared to live with the result, good or bad, and that they need to examine the consequences before they make that choice. I sent your quote to her. It's perfect for her classroom! This is so timely. I also pick a word or phrase for each new year. This year has been tough to pick one for me because we are focusing so much on the needs of the family right now. I love this idea of picking a family phrase this year. It just "feels" right, you know?! Thank you! Yes they do. Thanks for sharing a wonderful motto. Decisions Determine Destiny...I'll write it down so I won't forget it! Thank you for sharing! What a wonderful quote from President Monson. I know in a couple of days it would be February, but I'll ask ny family to choose a motto in the next FHE. I love it! I do a family quote too. This year is Bury your sword. ps-I'm a new follower and I love your blog! Such a wonderful quote... I love that merely a few words can hold so much meaning, inspiration and the power to bring about change! If you get a chance feel free to visit my blog, say hi and to enter my follower giveaway for a chance to win a $30 Voucher & free postage to Shop @ SpaNGle. I really love that saying! 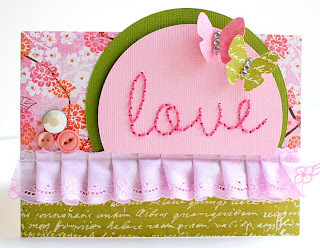 I am dying to try out hand stitched letters.